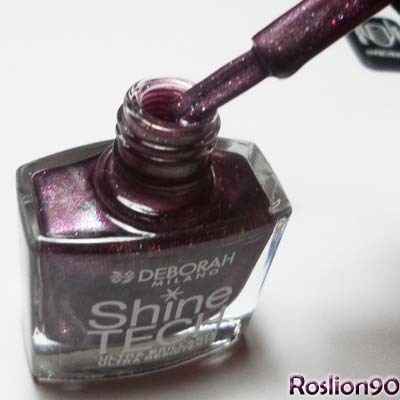 Roslion90 Nails & Co.: Deborah Milano Shine Tech Magnetic Nails n°79 "Pearly Magnetic Violet"
Deborah Milano Shine Tech Magnetic Nails n°79 "Pearly Magnetic Violet"
In this post I want to talk enamel Milano Deborah Shine Tech Magnetic Nails No. 79! And 'one of the 6 colors straight out, after the magnetic Shine Tech in 2011, Deborah Milano has launched the new glazes with a "magnet ripple effect" that gives a 3D effect to nail art! The name of this polish is "Pearly Magnetic Violet", a wine-colored tending towards Bordeax with multicolored glitter. Shake nail polish so vigorously. Spread a thick layer of polish on the nail. Decorate the nails one by one, approaching the magnet to the enamel still fresh, at a distance of 2/3 mm for 10 seconds (For having a better result hold the magnet more seconds). Depending on the direction given to the magnet, in order to realize unique and original. Seal the nail art with a fresh coat of top coat, once dry. 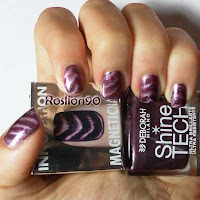 The magnetic effect I have always loved and it is for this that the Shine Tech Magnetic with their ripple effects are noteworthy. The launch price is € 8.50 for 8.5 ml of the product with a maturity of 36 months after opening. The duration was 5 days, and is able to maintain its luster over time.